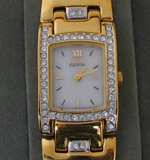 Womens Citizen Eco-Drive watch. The watch face is surrounded by beautiful Swarovski Crystals! No battery needed with the Eco-Drive technology. 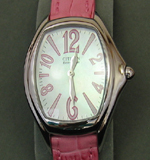 Womens Citizen Eco-Drive watch with a pink leather band. All Citizen Eco-Drive watches do not need batteries and come with a 5 year limited warranty. Stop in Ochman's for details. 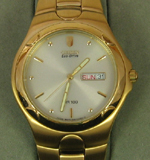 Mens Citizen Eco-Drive watch with a gold tone band. Watch displays the day and date. Check out Citizen Eco-Drive technology at Ochman's. 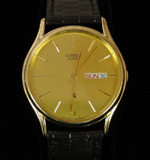 Mens Citizen Quartz watch with a gold tone face and leather band. Watch displays the day and date.